As I'm not familiarized with VB.NET I am requesting help for my last school project this year. So I have a ListView with many emails and want to send a certain message to those emails but using multithreading because If don't the application will stop responding. 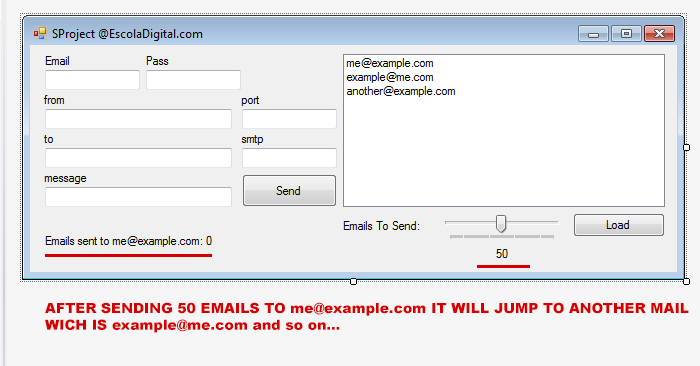 I also want to send that message X times to the same email and then pass to another one with multithreading too. Keep in mind, this NOT a spammer as everyone is saying to me on another forums. I'm doing this for my last school project this year and I chose to make an bulk email sender. I'm not really familiarized with VB.NET, that's why I'm asking someone to help me deeply. I'm not here to get my whole project done, just want a good help, I'm like 0 skill with VB.NET but need this done, I'm willing to get any help from you.